If you want to be in the publishing business, you have to listen to your inner voice and continue persistently moving ahead--even in the face of rejection, disappointment or any other obstacle. Many of the decisions are admittedly subjective. One person loves your writing and wants to get it out into the marketplace while someone else doesn't see it and rejects it. You (and I) are on that constant search for someone to champion your work and get it published. It's not easy and takes a good measure of regular and consistent persistence. I love this quotation from James Whitcomb Riley which came across my screen today from Cynthia Kersey at Unstoppable. Riley said, "The most essential factor is persistence - the determination never to allow your energy or enthusiasm to be dampened by the discouragement that must inevitably come." 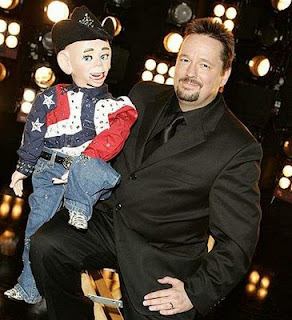 In my local newspaper, I ran across this story about Terry Fator, the Dallas-based ventriloquist who captured the heart of America last year in the America's Got Talent contest and won a million dollars. You may have skipped over this story but I'd encourage you to read it again and look for the persistence. Fator was "on the verge of bankruptcy" (first paragraph), "snarky comments about ventriloquists" (third paragraph), and the turnaround (fifth paragraph from the end of the article) "In February 2007, Fator auditioned his act for three different Las Vegas producers; each one told him he wasn't "Vegas material." This May, he signed a $100 million, five-year deal to headline at Vegas' Mirage hotel, beginning Feb. 14. Now he has a full-time manager, road manager, publicist and a team of writers." In the face of rejection, we need to persist in improving our craft of writing but also getting our work into the marketplace for consideration (and possible acceptance). It's what I'm doing today. How about you? Very good and encouraging post! I agree, persistance is really important. Those that have "Stick-t-it-iveness" are going to be the ones that are still around when the contract finally comes rolling in. What am I doing today? I guess I'm still on the 'working on my craft' part, editing my current book and learning so much in the process. It is hard to know when the time is right to going from editing and revision to the proposal process. This time last year, he was getting ready for a show and had booked a 1,000 seat auditorium. As he took the stage, only one person sat in the audience. Yes, one lone 12-year old boy came to his show. Terry sings, does ventriloquism, and his dummies impersonate celebrities. He's the best I've ever watched, absolutely pure entertainment. But when no one came to his show last year, he almost gave up his dream after 32 years of practicing and performing. All those years, he worked hard. He practiced. He developed skills. He kept trying. He knocked on doors. He sang. He made up new skits. He created. He performed. He dreamed. Did I say -- he never gave up? What an inspiration for all of us. Dreams do come true. Terry went from "one" fan, to number one on this show. He is a winner. The Lord says, He knows the plans He has for us, plans to prosper us, not to harm us, and He will give us hope and a future. I am not praying for a million dollars, although you can write me a check if you want to. But I am praying with a hopeful heart about my writing pursuits. I don't want to look back, and wish I had tried -- So, I'm taking my act on the road for God...How about you? Inspiring story, Terry. Thanks! Every time we're tempted to give up, we should remember that maybe THIS is the submission that's going to turn heads at that publishing (or agent) house. I really admire that guy--playing to an audience of one takes a lot of guts. So much of life isn't for the faint of heart! We certainly need to encourage one another to never give up. I've been writing since I was small. Recently, I've begun submitting artilces for publication. My first magazine article will be published this fall in a magazine with a circulation of 100,000! I received a request to expound on another article I had submitted to another magazine. I've begun working on a book and am trying to let God lead in everything I write. I appreciate the guidance you offered on magazine articles. It will be very helpful. Thank you and God Bless!